Lightweight Gun Metal Grey Frames Manufactured from a Shatterproof Polycarbonate Compound, With Blue Rubber Head Grips and Blue Nose Pads. Love these for the bike mainly, but general use as well. GF says I look like a celebrity! Good quality shades and anti glare works a treat. Thoroughly recommended for the price, they are well worth investing in. I bought these glasses after reading review of many others, and I am pleased with the purchase. Used it to commute on my bike through the city, and have tried so far in hot, cloudy as well rainy weather on most of the terrain (city roads, hills, etc.). I wanted a pair that I can use without switching glasses like other models of sunglasses do. This does the job. These are very light full plastic sunglasses. 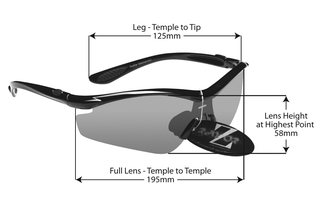 As part of a road cycling team, I need a good quality pair of cycling sunglasses and these definitely deliver! The lightweight frame means you don't even notice you have them on and the 1 piece lens stops any sunlight from getting near your eyes meaning I can concentrate on my cycling with no distractions. The rest of my team have now also purchased Rayzor sunglasses having been impressed with my own pair!